Established in 2012 to help our nationals from the East. Foundation For Polish Community now raises funds to teach and support school pupils as well as tries to find a new school location. 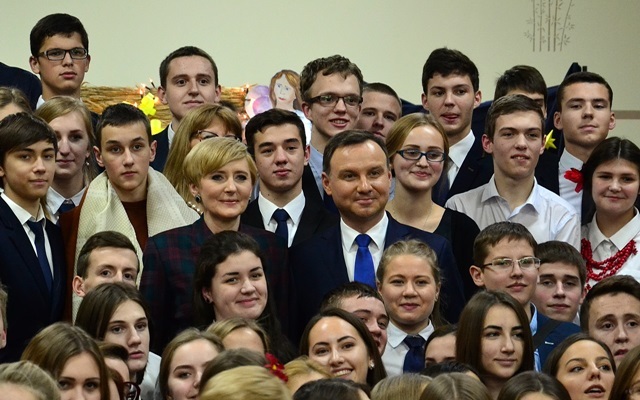 Therefore the Foundation has established the School Patronage Effort to help Polish teenagers from the East. The Foundation is a non-profit organization, and its projects for Poles in the East are financed thanks to specific subsidies and payments from sponsors. Without People of Good Will this activity would not be possible. Polonia High School Collegium St. Stanislaus Kostka is an extraordinary school, with over 100 pupils aged 15-18 who come from Belarus, Ukraine, Kazakhstan, Georgia, Armenia, Russia, Moldova and Uzbekistan. The youth are accepted to the school following recommendations from respective Polish consuls, local Catholic Church and eastern organizations. Our pupils are descendants of Poles who found themselves outside of Polish borders due to deportations, II world war and post-war changes of Polish borders. They have resisted sovietization and continue struggling to maintain their national identity. Our mission is to provide young Poles from the East with sound education and to rebuild their links with Poland. Polonia High School was founded in 2003 and the educational and upbringing programme is conducted by teachers from the Catholic Association of Tutors. The school continues tradition of an elite Gymnasium and High school for boys, which operated in 1908-1944. Under the patronage of landowning families there studied talented poor youngsters mainly from the eastern outskirts of Poland. High school for children with Polish roots keeps up mainly from subsidies from Educational department, which covers only a part of school and dormitory cost. The money is not enough to assure pupils’ board and extra Polish lessons. Polish families from the East cannot afford to pay for the education in school and for accommodation in dormitory. Therefore, we invite people of Good Will who are not indifferent to destiny of compatriots from the East, to join the patrons of our talented and hard-working youth. School Patronage involves sending financial help for a specific pupil for a period of one year or longer. Any person or company can become a sponsor if they regularly pay an amount declared at any level. In return, the sponsor receives information about the pupil’s progress, interests and plans for the future. Returning to Poland is a great chance for young Poles from the East to start a new life in their grandparents’ motherland. It is a possibility to study Polish and learn about culture and traditions. After three years of school they pass High School Diploma Examinations with even better average score than their peers born in Poland. How can I help in the education of the teenagers of Polonia boarding school? 35 USD – provides meals for one pupil for a whole week. 60 USD – food and dormitory accommodation for the whole week for one pupil. 100 USD – monthly dormitory accommodation of one pupil. 150 USD – breakfast, lunch and dinner for one pupil for one month. 250 USD – monthly support for one pupil (food, teaching aids and accommodation). Big Thanks to Everyone participating!